America’s bizarre obsession with Starbucks holiday cups continues this week and finally, I’m here for it. After years of being “boycotted” and harassed on Twitter by the religious right (and our president LOL/sob emoji), Starbucks came out swinging with its 2017 holiday cup, which potentially features the hands of—gasp!—lesbians. Who actually cares about this stuff, you ask? Allow this big lesbo to explain. The drama started when this country really began circling the drain in 2015. Starbucks, which had traditionally emblazoned its cups with snowflakes and other holiday swag, had the nerve to use plain red cups. Things didn’t get any easier for the heathen coffee bean pushers in 2016, when an early version of the holiday cups were green. This set off another firestorm among people who desperately need to fill some sort of sad void in their lives. This is why the arguably gay 2017 campaign is so perfect. You want your goddamn symbols of Christmas, America? Fine. We’ll give you a red, white and green cup, gift-wrapped presents and even a Christmas tree—but you’re getting some lesbians, too. Starbucks released its design on YouTube last month, but Lesbogate seemed to kick off Thursday thanks in part to this BuzzFeed post. “I can attest to the lesbianism of The Hands,” one gay BuzzFeeder said in the piece. As for the cups themselves, it’s hard to say whether the hands are the hands of lesbians—mostly because this is a goddamned illustration of hands on a coffee cup. But BuzzFeed is convinced, and after seeing the video, I think the evidence is definitely there. My tattoo artist also pointed out recently that when illustrators draw the hands of women, they tend to be more “elegant” and void of detail: long, pointy fingers gracefully splayed, holding a rose or delicately touching something. I’d argue that “The Hands” on the Starbucks cup are a bit like that. 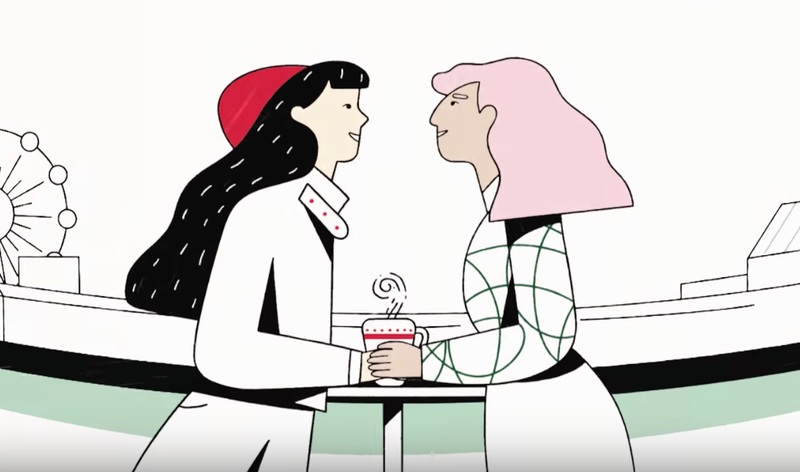 But I’d also say this: Whether or not that was the intention, it’s cool that Starbucks acknowledged lesbians in their marketing. And probably a smart business decision. I mean, look at how nice we are to Subaru. When the world is a dumpster fire and reality is too overwhelming to process, it’s nice to talk about things like this. It’s nice to pretend that everything’s OK and that the world is full of lesbians in love sipping their gingerbread lattes and not bracing for a nuclear holocaust.